As it turns out Ford is planning to revive the Explorer Sport legacy which was born in the 90's and went pretty much under the radar in the early 2000's. 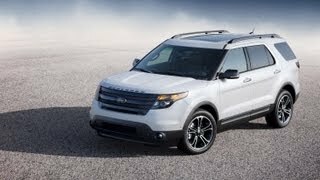 In other words, Ford has revealed the upcoming 2013 Ford Explorer Sport, a four door SUV boasting great performances and I quote "highest-performance, most capable Ford Explorer ever". Unfortunately, Ford hasn't revealed the exact specifications of the upcoming Ford Explorer Sport just yet, but under the bonnet we can expect to find a 3.5 liter EcoBoost V6 engine which can be found on the Taurus SHO, F-150 and Ford Flex. Allegedly, the 3.5 V6 will be able to develop at least 350 horsepower once Ford engineers are done prepping it for the Explorer Sport. 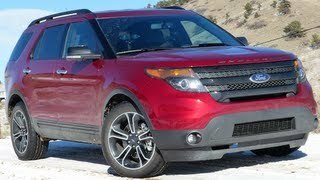 Although the amount of torque produced by the engine in the Ford explorer Sport 2013 hasn't been revealed, Ford announced that the Explorer Sport will have a towing capacity of 5,000 lbs. Additionally, they've mentioned that the standard variant of the Ford Explorer Sport 2013 will sporta six-speed automatic gearbox coupled with paddle shifters on the steering wheel and the TerrainManagement off road control system. 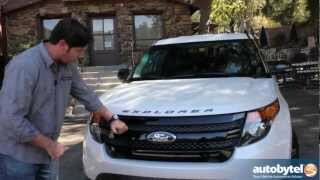 On the exterior, the Ford Explorer Sport 2013 has undergone a few modifications from an aesthetic point of view, for the sake of standing out when put head to head with the Ford Explorer 2013. A new set of 20-inch allow wheels have been fitted on the Explorer Sport, and as far as the color scheme goes, the Explorer Sport comes in Ruby Red Metallic Clearcoat, Tuxedo Black Metallic, Platinum Metallic Tri-Coator Ignot Silver Metallic. In addition, color scheme will come hand in hand with black trims on the roofrack, side mirrors, liftgate, headlamps and taillamps. On the interior the Ford Explorer Sport 2013 is pretty much the same as the Ford Explorer, but you can expect some minor changes such as new steering wheel stitching, illuminated scuff plates and revised appliques. As far as the equipment goes, the Ford Explorer 2013 is going to be quite generous and will offer automatic climate control, MyFordTouch, a Sony audio system and power front seats as standard. Optional extras consist in a moonroof, proximity key, inflatable rear seat belts, park assist and blind spot/cross-traffic monitor. 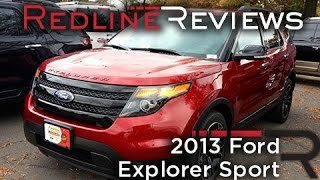 As for its pricing, unfortunately Ford hasn't revealed anything concerning this matter just yet, but the Explorer Sport 2013 is set to hit the automotive market later this year.